This Wild Turkey Rare Breed vs. Forgiven Review is shared with us by a fellow Bourbon Sipper and guest contributor, Joe Cornwall. Enjoy. The wry impact of rye defines so much of American whiskey. Today I’m taking just a few minutes to do a side-by-side of two of my favorites, Wild Turkey Rare breed and Wild Turkey Forgiven. Wild Turkey RB is my “reference standard” bourbon ever since Jim Beam went NAS on Knob Creek. This is the latest batch at 116.8 proof. On the nose it’s caramel, vanilla, char and a hint of sweet berries & fruit. Mouthfeel is beautifully viscous with essence of creamed corn, Crème brûlée and a touch of cinnamon. Forgiven is a limited edition small batch blend of bourbon and Rye straight whiskey. On the nose it is pepper and ethanol, barrel oak and red hots. Mouthfeel is thinner than Rare Breed and the youth of this whiskey is painted in bolder colors of tart orchard fruit with a warm, lingering, peppery finish. At 91 proof it tastes hotter than Rare Breed at 116. Should you have both of these on your bar? The Wild Turkey Rare Breed is a true sipping bourbon that shows its colors when enjoyed neat or on ice. With a mash bill of 75% corn, 13% rye, and 12% malt, it’s spicier than one might think, but at the same time exhibits perfectly balanced sweetness to counter the pepper. It is a top value in a world where indifferent $35 wheaters (I’m looking at you, BT) can have a waiting list and premium price because of the label they wear. Rare Breed is a $40 juice that easily stands with $80 bottles from anyone else. 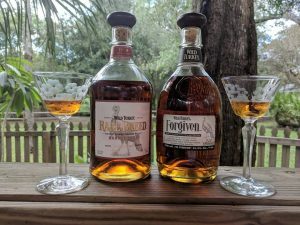 The Wild Turkey Forgiven is a superb cocktail whiskey and is a great choice for a Manhattan or Old Fashioned. It features 78% WT 6-year-old bourbon and 22 % 4-year-old WT rye. There’s absolutely nothing wrong with an artfully concocted blend, and this is one of the better examples. Compared to a High West Bourye, for example, or a high-corn rye such as Rittenhouse bottled-in-bond, it’s very competitive in price and taste profile. Because I like it more as a mixer, I’m not sure I’d argue that Forgiven is unique or special enough to displace a Pikesville or tasty High West variant in the liquor cabinet. If you enjoyed this quick highlight of WT RB and Forgiven, be sure to join the Bourbon Sippers facebook group where it was first shared to see more thoughts like it!